Hidden in the mountains beyond lies The Forgotten. Despite its name it is remembered in the legends, spoken of what it once was. As time goes on the tales get bolder and The Forgotten is really remembered... in the legends anyway. It is a place that has not seen the footprints of man, elf, vampire, or any other race for at least, at last count, 6 generations. It is a place thick with trees and underbrush. Mists hang over it hiding it from the view of those races that can fly. Likewise all passageways leading to The Forgotten are closed off. 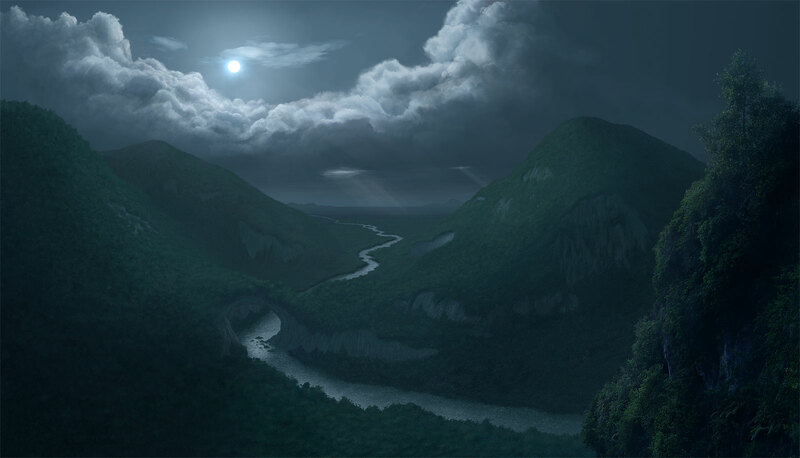 However, so legend goes, three times a year the full moon crests the highest peak. The mist clears as though by command of the moonlight. The pure golden rays fall over the edge of the peak, dropping down over the cliffs onto the gentle slope of the downward hill. It illuminates the greed of the trees and the underbrush. The light pauses when it touches upon the river, reminding those that listen to the tales enough that if a river can get out an explorer can get in. After the pause the moonlight creeps upward spreading the glowing light of night onto the other side of the hill until the entire valley of The Forgotten is revealed. And still not much can be seen if looked down upon from the skies, at least not much that merits full exploration. Sure there is an abundance of wood. And sure there is the possibility that the river carries some of the healing powers of the Reich der Heilen. But is that enough to make this area worthy even of mention? No, though both are distinct possibilities. What makes this area worthy of merit is what it hides. What is forgotten is what tempts courage even in cowards. A temple lies hidden there. A temple whose people one dared to believe they were the most powerful in the world. A temple which holds more treasure, more knowledge than any in our world can possibly imagine. It was the ignorance of those that dwelt there that brought about their demise. It was their pride in thinking they were above even Nature that destroyed them. And yet time went on, as time will, and time turns lava into prime fertilizer making good soil better. Once again the valley became lush and rich with natural resources. The Forgotten grew again, however, it remained to this day untouched save by the migrating birds and... the monkeys. Legend says that should one be brave enough, one might be fortunate enough. One might just be able to make it through the dangers of the quest to discover the lost temple of The Forgotten where lies the preserved treasure and library, as well as the decayed remains of those whose pride led to their fall.